Home › Culture › arts & entertainment › Seen & Heard Film Festival – opens tonight! 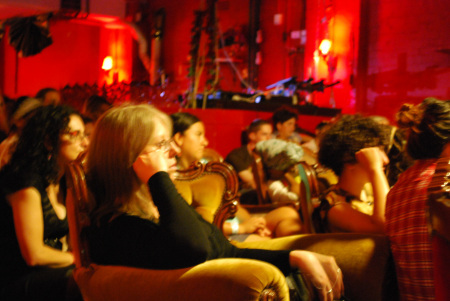 Seen & Heard is a three-night festival of films made to celebrate women’s voices. The full programme can be downloaded from their website. Tickets are $15/$10, or $35 for the full festival. Tickets can be purchased though their site, or at the door. Proceeds go to Life Force Cancer Foundation. When we complain about the lack of opportunities for women in roles of creative authority in film two common responses are the claim that good ideas and good artists get picked up, so women must just need to do better work, and the injunction “Go and do it yourself. Great artists make things happen.” An event like this demonstrates how much women are already doing this, but also the limits of the strategy. The people involved in this project really are getting up and making things happen, which is wonderful. However, it cannot in itself create any changes in the status quo of mainstream filmmaking: who gets hired, funded, distributed and recognised. They can only hope to make themselves so visible that it would be embarrassing for those with greater power to ignore them. So let’s help them get visible! Seen & Heard is a Sydney-based festival that is coming back for a fourth year of screening exciting new films made by women from around the globe. Whether directing, writing or producing, Seen & Heard promotes the message that films made by women are not just for women, but are films that should be seen by everyone. The films that will be shown during the three day festival address issues relevant to all: race relations within Australia, the treatment of those with disabilities, issues relating to class, gender and sexuality, as well as the everyday challenges of friendship, self-discovery, joy and loss. And some of the films have none of these redeeming features, except for good ol’ fashioned fun! We believe that the lack of women in the film industry is an impoverishment to our culture, one that can only be rectified once we recognise that the dramatic underrepresentation of women amongst both cast & crew is a problem.